The Human Cell AtlasFor the past 150 years scientists have classified cells by their structures, functions, locations, and, more recently, molecular profiles. The but the characterization of cell types and states, however, has remained surprisingly limited. This limitation has constrained our ability to understand fundamental biology and to translate this understanding to diagnose and treat of disease. Fortunately, an extraordinary opportunity is emerging because of transformative advances in experimental and computational methods. These advances have led the scientific community to launch the Human Cell Atlas (HCA), an international collaborative consortium that aims to create comprehensive, open reference maps of all human cells—the fundamental units of life—as a basis for both understanding human health and diagnosing, monitoring, and treating disease. We expect that the HCA will have profound impact on every aspect of biology and medicine, propelling translational discoveries and applications and ultimately leading to a new era of precision medicine. Aviv RegevAviv Regev is a professor of biology at MIT, a Howard Hughes Medical Institute Investigator, Chair of the Faculty and Director of the Klarman Cell Observatory and Cell Circuits Program at the Broad Institute of MIT and Harvard, and she is co-chair of the organizing committee for the international Human Cell Atlas project. Aviv is a computational and systems biologist. She studies the molecular circuitry that governs the function of mammalian cells in health and disease. She pioneered many leading experimental and computational methods for the reconstruction of circuits , including in single-cell genomics. Aviv is a recipient of an NIH Director’s Pioneer Award, a Sloan fellowship, the Overton Prize from the International Society for Computational Biology (ISCB), the Earl and Thressa Stadtman Scholar Award from the American Society of Biochemistry and Molecular Biology, and the ISCB Innovator Award, and she is a ISCB Fellow. She earned an M.Sc. from Tel Aviv University, studying biology, computer science, and mathematics in the Interdisciplinary Program for the Fostering of Excellence and she earned a Ph.D. in computational biology from Tel Aviv University. At 8:02 p.m., President Larry Millstein called year’s Presidents’ Lecture, the 2,387th meeting of the Society, to order. He announced the order of business, announced the evening’s lecture would be livestreamed on the internet, and welcomed new members. The minutes of the 2,386th meeting of the Society were then read and approved. President Millstein then summarized the 39th meeting of the Society, held in 1873, the details of which are summarized in the first volume of the PSW Bulletin. For the past 150 years, scientists have classified cells by their structures, functions, locations, and, more recently, molecular profiles. But, the characterization of cell types and states, however, has remained limited. Fortunately, an opportunity is emerging due to advances in experimental and computational methods that are changing our understanding of cell type and state characterization. Scientists long lacked understanding of how it is that we have one genome which produces so many cell types. But, through technological advances, scientists have learned that different cells select which parts of their DNA are transcribed to RNA, and which strands of RNA are translated into proteins at which level and how stable those proteins will be. This understanding explains the qualitative and quantitative differences between our cells. It also allows us to identify genetic variants that cause different diseases. Regev said understanding that understanding cells’ gene expression provides us with a unified set of coordinates, by which every gene is an axis and every cell is a point a high dimensional space. The position of a cell in this space is its expression profile. Cells with similar expression profiles will be near each other. Unfortunately, we can measure the expression of every RNA in a cell, but not the expression of every protein. Moreover, until recently we have only been able to measure averages of these expressions. Fortunately, technological advances have allowed us to measure individual cell expression. The first major advance was single cell genomics, which allows us to capture an individual cell, capture the RNA of that cell, transcribe it to DNA, and to sequence that DNA. In the last ten years, scientists have gone from sequencing dozens of individual cells at once, to sequencing millions at a time. The second major advance was spatial genomics, which has allowed scientists to observe things in situ, within individual cells’ tissue. As yet, this technique works on only dozens of cells at a time. These advances have led the scientific community to launch the Human Cell Atlas (HCA), an international collaborative consortium that aims leverages scale to create a comprehensive reference map of the types and properties of all human cells, as a basis for understanding, diagnosing, monitoring, and treating health and disease. The HCA sees itself as similar to the Human Genome Project, but tackling a more complex task. 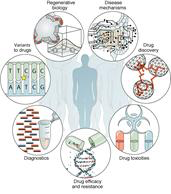 Whereas the Human Genome Project mapped the human genome with concerns about variations between people, HCA seeks to map cells, which are different not only between people – but with time, activity, and other conditions within any individual person. The comprehensive map that HCA seeks to produce may be described as a “Google Maps” for the human body. In the bounds of its first draft, HCA has identified 30-100 million cells, estimating that it will have identified more than 10 billion unique cells when finished. Regev expects the HCA will teach us fundamental biology about the taxonomy, histology, developmental biology, and physiology of human cells. Ultimately, Regev believes the HCA will ultimately lead to a new era of precision medicine. One guest asked why HCA uses open source software instead of free source. Regev clarified that while open source, HCA’s software is under a MIT BSD license, which she said is a good, non-contaminating approach. Another guest asked how HCA intends to obtain its tissue samples and whether it intends to take samples from the same donors over time. Regev said biopsies are helpful, but too small and too random to develop maps of full organs. Post-mortem and transplant donors, however, allow for full organ sampling. After the question and answer period, President Millstein thanked the speaker, made the usual housekeeping announcements, and invited guests to join the Society. President Millstein then adjourned the 2,387th meeting of the Society to the social hour.